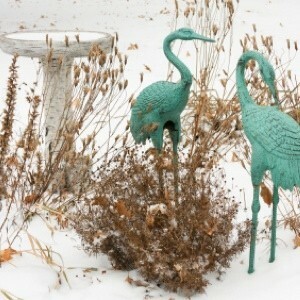 For most gardeners, the beginning of the winter season comes as a welcome relief. It means they can finally turn their attention to other projects for awhile. Around mid-January, however, the seed catalogs start to arrive in the mail and anticipation for the new gardening season starts to build. With a few months of winter still left, suddenly spring can't come soon enough. Here are some activities to help pass the time while waiting for the next growing season to arrive. Catch Up On Your Reading: During the growing season, most gardeners are too busy planning, planting, and problem solving to spend any appreciable time reading books about gardening. Now that the season is over, catch up on your reading. Explore new types of plants and garden techniques and get some inspiration for next year. Get Organized: Winter is a great time to reorganize the tool shed, clean up neglected pots and seed-starting trays, and layout plans for next year's garden. Think about this past year. What worked well and what might you do differently next year? Take an inventory of your current plants and supplies and make a list of your wants and "must-haves" for next season. If you start your plants indoors, make sure to mark your calendar for when it's time to start seeds. Stock Up On Supplies: Late fall and early winter can be great times to score discounted prices on supplies like mulch, potting soil, containers, and garden tools. The selection is usually is thinner, but so are the crowds. Take advantage of year-end sales before the lawn and garden equipment is moved out to make room for ice scrapers and snow shovels. Always order seeds that are proven to grow successfully in your area. Resist the temptation to order more than you need. Focus On Your Houseplants: Check them carefully for pests and diseases, prune away any dead or leggy foliage, and freshen them up with a little new soil. If plants appear to be getting rootbound, repot them into a container one size larger. Create Garden Art: If you're the crafty type, the off-season is a great time to take on garden art projects like decorating flower pots, painting garden gnomes, or casting stepping stones. Try New Recipes: Find a great salsa recipe calling for banana peppers? Discover you love rosemary? If you like to grow vegetables and herbs, experimenting with new recipes can be a great way to help you decide what to grow in next year's garden. Visit An Indoor Garden: Spending an afternoon at a conservatory is a great way to ward of the winter blues because something's always growing. Many botanical gardens on put on seasonal flower shows, arrange art exhibits, and lead workshops and classes on gardening, cooking, and the arts. Interact With Gardeners Online: The Internet is home to a huge network of gardeners and garden bloggers. Type "garden blogs" into any search engine and gain instant access to dozens of garden blog directories. There you can connect with other gardeners based on your region or interests. With free platforms like Blogger, even the most technically challenged gardener can have their own blog up and running in under 5 minutes. Blogs are a great way to keep an online gardening journal and to connect with and learn from other gardeners. Buy Yourself Bouquets: After awhile, winter's lack of warmth and color can make for a dreary outlook. Treat yourself to the occasional bouquet of flowers. Their color, fragrance, and vitality feel good to be around and will help raise your spirits until spring arrives. I would recommend that you take this time to start a garden journal, if you don't already have one. You can fill out the history of perennials, trees and bushes: when they flower/fruit, what maintenance/pest control has been done on them, etc. I mean to do this every year, and never quite manage. Perhaps this is the year!